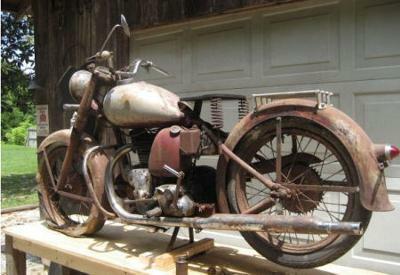 I have a fully restore-able 1948 Indian Motorcycle for sale priced cheap! The price is low considering finding these old Indians in anywhere near decent, complete condition is becoming more and more difficult. Anybody with a little time on their hands could have a really fine, highly sought after collector's bike or part it out for restoration parts for more than I'm asking for it. I don't check my e-mail very often so it's best to call me if you have questions or want to make an appointment to buy but you are welcome to review or leave comments regarding the Indian in the space below that has been provided byGoGoCycles Used Motorcycles for Sale (and PLEASE do not neglect to include your contact information in your email or to provide a phone number or email address!) so that I can respond with answers to your questions or after consideration of your best offer as quickly as possible. Old Indian motorcycles for sale like this one don't pop up every day so hurry and make an offer before this one gets away from you! GoGoCycles would also encourage bikers to submit a review of the Fully Restorable 1948 Indian motorcycle for sale to make the biker community aware of any problems that are commonly associated with the 1948 model or to highlight its positive features and help potential buyers make informed decisions. My price on this potentially amazing Indian project is just $3500 and if you're interested you can get in touch with me if you are seriously interested and want to buy the Indian and don't forget to mention that you found this ad on GoGoCycles Motorcycle Classifieds gogocycles.com). Hi have you got the title of this Indian?